An adult bald eagle takes to the air on a cold winter day in Homer, Alaska. The graceful flight of a Bald Eagle, Haliaeetus leucocephalus, as it swoops overhead and follows the coastline of the Homer Spit in Alaska, USA. In this picture of a Bald Eagle, I've captured the motion of the wings as they curl at the tips and provide lift for the bird while the tail feathers provide balance and stability. The talons are safely tucked away during flight but always on the ready to either pluck an unfortunate fish from the water, to land, or in defense. Picture of a determined looking bald eagle flying above the shoreline in Homer, Alaska, USA. ... eagle has a determined look in its eye as it moves to a new perch, or has it spotted a tasty looking morsel of food somewhere? 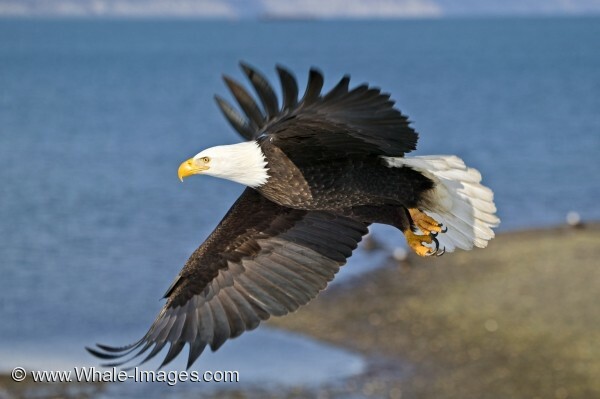 Make sure to see these Bald Eagle Pictures.